An edge of dock leveler (EOD) is used to bridge the gap from the edge of a loading area to a truck or ramp. As opposed to a dockboard, EODs are fixed to the loading dock. Copperloy edge of dock levelers are ideal for use when trucks are backing up to a dock. With a simple pull of the handle, the leveler will lift over the top truck height for easy positioning. 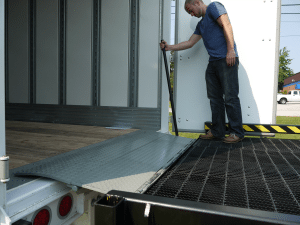 They mount easily to most docks and are available in 66″, 72″, 78″ and 84″ widths. 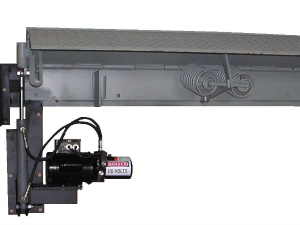 Our shipping dock leveler is capable of servicing trucks 5″ above or below dock levels and is available in both 20,000 and 30,000 lb. models. 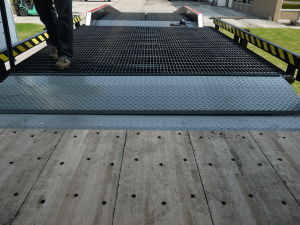 A loading dock leveler is a perfect solution for when dock space is limited, or when the working range of a full-size, pit-style edge of dock leveler is not needed. Each Copperloy EOD is available with hydraulic or mechanical activation (lift) for smooth and reliable operation. Simply pull back the handle and the lip will mechanically lift over the dock height. Then, a slight forward push of the handle will position the lip onto the truck floor. All of our edge of dock levelers for sale are available with our quick, 3-day shipping. 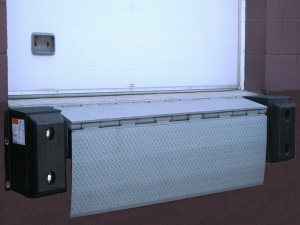 With loading dock equipment from Copperloy, you’ll get more done in less time, and increase your overall capabilities. 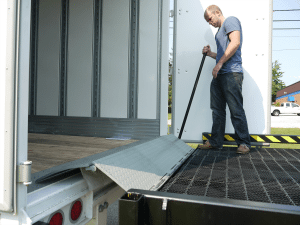 Truck dock levelers correct the height differences between the truck and loading docks or platforms. Copperloy’s edge of dock levelers compensates for 5″ above or below dock levels. 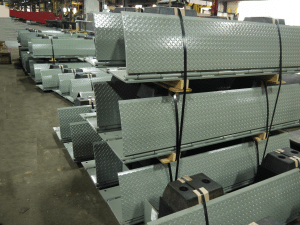 These durable products are designed to handle 20,000-30,000 lbs. Make quick work of otherwise tedious loading and unloading tasks with Copperloy truck dock levelers. Each Copperloy dock levelers are smooth and easy to operate. Whether using the handle or the wall-mounted push button (on the hydraulic unit) your EOD extends fully to the height of the trailer bed for safe freight handling. All the benefits of the mechanical system are also available in our hydraulic material handling dock leveler models. To ensure product durability, the EOD has been designed and engineered using a three-dimensional engineering software package. Quick, easy lifting and positioning: Our exclusive lift mechanism and spring assembly sets the board in place with one-quarter the effort needed to operate conventional edge of dock levelers. Push button operation on hydraulic models. Ideal for retrofit: The Copperloy Edge of Dock leveler easily mounts to the face of almost any dock. Transition plates and approach ramps are also available. 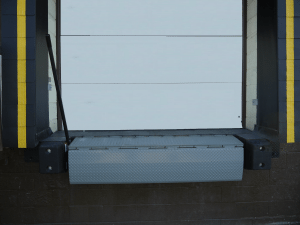 Safety: Every Copperloy Edge of Dock Leveler is equipped with a safety maintenance strut to secure the unit while performing routine maintenance. Low maintenance: Maintenance is reduced to simple lubrication of hinges which come equipped with grease fittings. High strength low alloy (50,000 lb. Minimum Yield) tread plate, lip beveled for smooth transition. Bumpers 16″. Ramp 13 1/2″ in the stored position. The lip extends 12″ beyond the bumpers on standard lip models and 14″ on refer lip models. 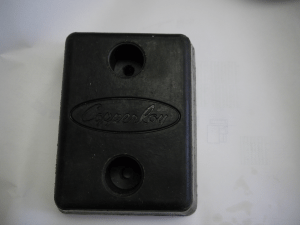 4″ x 13″ x 10″ molded reinforced rubber mounted to the steel box frame. Optional 4″ x 12″ x 13″ bumper assembly. 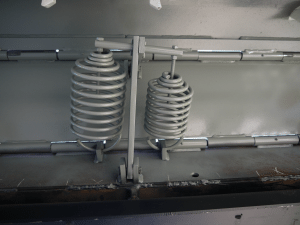 The unit is completely cleaned, deburred and painted gray. Capable of servicing trucks 5″ above and 5″ below the dock. 20,000 lb. and 30,000 lb. For proper dock level installation, it is crucial the installer reviews the edge-of-dock manual and considers the precautions. Initially, it is the installer’s responsibility to evaluate the health of the dock area and make any necessary repairs. All anchors must have a minimum strength in shear of 10,000 lbs force and a minimum of 6,000 lb pullout strength in uncracked concrete. The dock leveler must also comply with all local codes. Consult with a member of our Copperloy for a complete overview of the proper installment steps. Also, check out the video below and the owners manual for a list of tips! Pallet jacks are not recommended on an Edge of Dock. It will be very bumpy for a pallet jack and it could bottom out with any height variation.